Risë and Sean Siegrist, Re/Max Direct real estate agents, talk about how they recently learned about GMOs in our food. They explain why you should join us on May 16th at 9am at the center court of the original Wellington Mall for the march and have your voice be heard. March Against Monsanto in Wellington, FL! Dr. Randy Laurich, owner of The Wellness Experience in Wellington, explains why it is important to join in on May 16th at 9am in Wellington and have your voice be heard about GMOs in our food. March, 2015 – Got Milkweed? Got Milkweed? Kids, parents and grandparents took part in “Butterfly Day” at St. Michael Lutheran Church in Wellington on Sunday, March 22nd, 2015. Local artist and activist Norman Gitzen spoke to the children about saving the Monarch butterfly and the importance of planting milkweed. St. Peters United Methodist church in Wellington, Florida was groovin’ to the incredible music of famed jazz pianist Copeland Davis Saturday night (September 14th.) It was a fun, musical night with the always versatile Copeland Davis playing everything from jazz, contemporary and classic tunes which the crowd thoroughly enjoyed. A great day of polo on Lilly Pulitzer Day, Feb. 15, 2015! 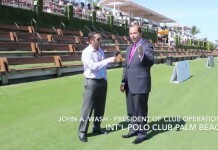 We hear from John Wash (President of the International Polo Club Palm Beach), Director of Catering Aaron Menitoff and champion polo player Kris Kampsen. Sponsored by the Boynton Financial Group and Hi-Tech Plumbing & Air. Jathy Garcia, owner of Hi-Tech Plumbing & Air, explains why it is important to join in on May 16th at 9am in Wellington and have your voice be heard about GMOs in our food. As a breast cancer survivor, Jathy is especially concerned with Monsanto’s product Round-up, which has altered the way food is grown internationally. Dr. Randy Laurich with Mark Bellissimo. Photo by Lois Spatz. 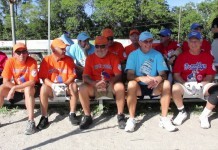 See our video about possibly the oldest and the funniest group of athletes in town, the Wycliffe Stiffs and their stickball league!